To the coastal Tlingit people, home is the mainland coast, islands, bays and fjords of southeast Alaska. Their lives revolve largely around harvesting the bounty of the sea outside their front doors. And the halibut, which grows to be the largest fish in the region, has long been an important resource for these natives. As such, this amazing fish is the object of several Tlingit legends. As I battled my first halibut in the icy sapphire waters of the Gulf of Alaska, one Tlingit legend I recently had read filled my thoughts. A native man returned to his home on a large island after a day of fishing and presented his wife a very small halibut. Disgusted, the woman threw the little flatfish onto the beach where it thrashed violently about. As the halibut thrashed, it grew. And as it grew, the violent shaking of the fish’s head and tail smashed the island to pieces. What was once a single island became broken apart to create the 1,884-island archipelago known today as the Queen Charlotte Islands. The halibut I had just hooked was certainly the equal of that one, or so it seemed. It thrashed violently. The harder I reeled, the more line it took. After a 10-minute fight, I hadn’t gained an inch. Friends back home had told me that fighting a halibut on hook and line is about as much fun as reeling in a sheet of plywood. But skirmishing with this brute convinced me otherwise. It was more like hooking a sheet of plywood fitted with a revved-up 50-horse outboard. Halibut fishing, I decided, is not only fun; it will challenge your strength and determination as well. In the end, I won my battle with the halibut. A 60-pounder it was, and to be honest, I was thankful it wasn’t larger. I was absolutely beaten when Capt. Andy Mezirow of Seward finally gaffed the fish and pulled it aboard the Crackerjack Voyager, a 46-foot sportfishing boat that was our home away from home for two days and a night on the Gulf of Alaska. We were fishing a mountainous reach of incredibly beautiful coastline near Kenai Fjords National Park, and though the air was cool, the halibut action was red-hot. Strikes often came just seconds after a bait or lure was dropped, including one hard hit answered by Rob Nichols of Burnaby, British Columbia. When he grabbed the rod and started reeling, it was instantly clear this was a sizeable halibut. Thirty minutes passed before we got our first glimpse of it. “I see color,” someone shouted as the fish began to show in the azure depths. “It’s freaking huge!”That it was. A halibut the size of a young steer appeared for a few seconds before powering toward bottom in another drag-burning run. Rob finally prevailed, and Mezirow brainshot the fish with a shotgun before gaffing it. With the first mate’s help, the captain hoisted it aboard – a big mottled specimen he estimated to weigh 120 pounds. The halibut is an amazing animal. When it’s just an inch-long fry, its left eye starts wandering—literally. The eyeball migrates across the fish’s snout and winds up on the other side of its face. Grown fish have both eyes lodged on the right side of their head, so they can lay on the sea floor and use both peepers to gaze upward, watching for prey. These fish have been on my list of “must catch” fish for decades. When I was a youngster, I caught flounders while fishing with my father in New Jersey’s saltwater bays. 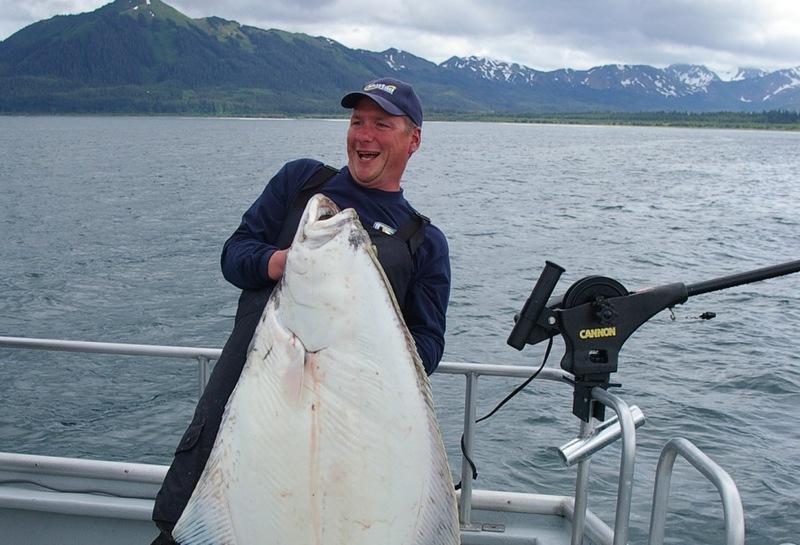 Later, when I saw magazine photos of the 200- to 300-pound halibut sometimes caught along Alaska’s coast, I couldn’t help but wonder what it must be like to catch flatfish that size. I finally got my chance when my friend Bob Funk invited me on a writers’ junket sponsored by O. Mustad & Sons and Cabela’s. The Pacific halibut we were after range from Santa Barbara, California to Nome, Alaska along the North American coast, and from Hokkaido, Japan to Russia’s Gulf of Anadyr along the Asiatic coast. Experts say the best fishing for trophy-class specimens, which anglers often call “barn doors,” is along Alaska’s southern coast from the Aleutian Islands to the state’s eastern border. The all-tackle world record, a 459-pounder, was caught near Dutch Harbor, Alaska, in 1996. The area east of Seward where we fished doesn’t receive as much publicity as halibut hotspots such as Dutch Harbor and Homer, but the waters here harbor a super-healthy population of halibut up to 300 pounds. In some places we dropped baits, the bite was so fast it seemed the bottom must be totally covered with 30- to 100-pound flatfish. Alaskan natives once fished for halibut with wooden hooks suspended below floats made from seal stomachs. Their fishing line was made from cedar bark, spruce roots, kelp and other natural materials. Today’s halibut anglers use heavy-action, 5- to 6-foot rods equipped with reels capable of holding up to 300 yards of 60- to 100-pound-test monofilament or braided line. On the Crackerjack Voyager, we used fresh herring baits enhanced with the addition of Mustad’s Ultrabite pheromone attractant in a Sure Strike capsule. The herring were impaled on big Mustad circle hooks crimped on leaders of 400-pound mono. These hooks are configured so the halibut literally hooks itself. A heavy, sliding lead weight carried our enticement quickly to the bottom in 100- to 200-foot depths, then the rod was placed in a holder. When a rod tip nose-dived toward the water, we knew a fish was on, and the fun began. Some in our party also fished successfully by bottom-bouncing 1/2- to 1-pound leadhead jigs with big plastic tails that resembled squid. Ultrabite attractant doused on the lures enhanced the bite. We didn't catch any 300-pound monsters during our trip, but each day, members of our group tested their strength and stamina by battling halibut in the 50- to 120-pound class. The 60-pounder I brought up was the biggest I managed to subdue, but I lost one that seemed far heavier. For a quarter hour that big halibut and I fought, and then suddenly, the hook came free. Exhausted, I looked toward the heavens and said a short prayer of thanks.